Hello everybody. I’m back again with my occassional posts to this blog. I think today’s announcement by Takamina that she intends to graduate from AKB48 next year is the end of an era in many ways in the group’s history and one that I’m really sad about. Takamina is only one of three that’s left from the 1st generation (Kojima and Miichan the others). She might not be the most popular member amongst the fans but she sure as hell is the hardest working out of all of them. If there’s one person that I’ve admired over the years of being an AKB48 fan for her sheer hard work it’s Takamina. As fans we only get to see one side of Takamina – the crybaby/goofy character she portrays but away from the cameras and the public eye I’ve got the feeling that she’s a determined woman who genuinely cares about the group and her fellow colleagues. She rallies the girls before a performance, scolds them if necessary but also is quick to praise if they’ve given it their all. It’s obvious that’s why Aki P gave her the job as General Manager even though she’d been doing it unofficially for years. I’ve been thinking for years what if a young teenage Japanese girl asked me to pick a female role model from their own country they should aspire to be and you know what, it’s probably Takamina I would choose. It’s not the performing side as an idol that I’m talking about here but what she does backstage. I’m sure I’ve read or heard somewhere that she’s the first to come to work everyday and the last to leave. A bright and intelligent woman that’s embraced the role that’s been thrust upon her. She’s given blood, sweat, tears and more besides in fulfilling her job as General Manager. As she said in her graduation statement, the job as General Manager isn’t easy, it’s a tough role for a young woman but she’s risen to the challenge and made it her own. I just couldn’t have seen anybody else in that role but her. So the baton of her job will be gradually handed over the next 12 months to a worthy successor in Yui Yokoyama. It’s a wise choice as I can see many of Takamina’s qualities in her. It’s true they could have chosen the old stagers in Kojima or Miichan as the next General Manager but I think both might also be graduating in 2015. I’m sure Yuihan will do a fine job and make Takamina proud. Even though I know AKB48 hasn’t been the same since Acchan, Tomochin and Yuko have gone, it will be strange not to see Takamina’s face amongst the members performing from 2016. I’m sure we will eventually find out what she intends to do after she graduates. I wish her the very best in whatever she does. Ohisashiburi, it’s been a long long time I know but I just had to say something after what took place on Sunday. By now every AKB48 fan will have found out what happened on Sunday evening at an AKB48 handshake event in the Iwate Industrial Culture Center Apio building when a 24 year old man came to the handshake event, hid a foldable saw under his jumper and violently slashed Rina Kawaei and Anna Iriyama in an unprovoked attack which brought terror to what is usually a peaceful and fun event for fans and AKB48 members to interact with each other. I’m quite surprised that it’s taken this long for such a terrible thing to happen if I’m being honest. There has been minor incidents before in a couple of handshake events but nothing quite as frightening and terrifying as this one. One thing is for certain – things will never be the same again. Believe me, things will change and it’s about time too. Security has been blamed for lack of body and bag checks but to be honest nobody expects AKB48 fans to suddenly attack their idols. The only problem is, this man wasn’t an AKB48 fan. He was a man on a mission to intentionally injure a human being. He picked this venue as there was a lot of people there. He didn’t go on purpose to try and murder an AKB48 member. It’s only thanks to the swift actions of a member of staff that we aren’t reading about a murder incident in the papers. Nevertheless, this unwelcome news has gone global with even the BBC picking it up. Rina and Anna are extremely lucky to have gotten away with minor injuries, it could have been a lot worse. Thank God both girls are fine – physically that is. The mental scars though will take a long time to heal. Both girls had emergency surgery for wounds to their hands and head and left the hospital yesterday to a scrum of media personnel waiting for them. So what does this mean for events of this kind in the future? There will be tighter security that’s for certain as this kind of incident MUST not happen ever again. I believe metal detectors are being touted in being used, probably stricter body searches too. Inconvenient for people perhaps but if all this means the girls will be safe then I’m all for it. To cancel all future handshake events would be a mistake. It’s a big part of the ‘idols you can meet’ concept and would be a huge loss to fans and I’m sure the members as well. They love meeting their fans. Anyway, I wish both girls and the AKB48 staff member a speedy recovery. UPDATE: Both Annin and Ricchan have broken their silence online and I’m glad to hear that they are feeling better. I’m sure reading all the well wishes and how concerned everybody is for their well being will make them happy. Don’t rush back to your work girls, please take some time out to recover and get over this traumatic experience. It’s good to know that you’re both smiling once more. Yes I’m still alive just not posting much on this site that’s all. Has it been 12 months since I last did a Top 10 AKB48 members list? During the last year, 2 members from my last list have graduated from AKB48 and gone to other groups. Sasshi has moved to Fukuoka to join HKT48 after her big scandal and Harugon has even moved country to China to be with Sae and SNH48. 2012 has been a phenomenal year for Wasamin. Not only did she debut with her first enka solo single which was fantastic but she also moved up the charts in the 2012 Senbatsu Election. With news that her 2nd single will be coming out soon, 2013 looks set to be an even bigger year for her. I’m so happy that Moeno had her day in the spotlight when she became runner up in the janken tournament in September and got even more exposure by being in the senbatsu for Eien Pressure. Yui has been very busy in the past couple of months which has seen her make her debut with NMB48 on stage in which she’s now a member. I still wish they would have made another proper Bimyo series with Honmayan as Yui was so funny in those skits. Takamina relinquished her job as Team A leader to become the overall boss of AKB48 (something she did unofficially anyway for the past couple of years!). Paruru storms into the Top 5 from nowhere. She’d had one of the best years of her life in AKB48 what with having the leading role in Majisuka Gakuen 3 to winning the janken tournament in September and getting the center role in Eien Pressure in the process. Paruru looks to be quite a shy person and she might be the next ace that AKB48 are looking for after Acchan’s graduation. I agree with Takamina and Mariko saying that Paruru and Acchan are similar in nature. I don’t understand why she has so many haters. She’s an adorable girl with a sweet smile. The new leader of Team K with some saying she was only given the role by Aki-P to make sure she wouldn’t graduate from AKB48. I can still see an announcement being made late in 2013 that she’ll be graduating to concentrate on her acting. Mayuyu was Yuko’s close challenger for the no.1 spot in the senbatsu election this year. Could she make it to the top spot in 2013? She was made center for AKB48’s appearance in the Japan Record Awards and a part of Kouhaku. Perhaps she’ll even be center for a future AKB48 single which is something she’s been craving for. I’m sure Yukirin felt hurt after being asked to move aside as Team B leader recently but as some fans have said was she really cut out to lead in the first place. Don’t get me wrong, she’s been great with Team B but I think with the pressure off her now Yukirin will enjoy her work even better. It’s brilliant that she’ll be debuting with her solo single in 2013 as she has such a sweet singing voice. My darling Umechan!! 2012 couldn’t have gone better for Umechan. Not only did she participate as a senbatsu member for a couple of singles this year, she was given the honour of leading Team B. I’m sure she’ll do a fine job as leader. Her TV profile has been on the rise lately and she’s becoming popular with the fans. What do you expect with her bubbly and cute personality! It’s been music to my ears to see her doing so well. Ganbarre Umechan and I hope you’ll be even more successful in 2013. Seeing that relations between China and Japan are at an all-time low with all the kerfuffle about the Senkaku Islands, is it a wise move by Aki-P to send two AKB48 members to Shanghai where they could be subjected to abuse and violence against them? We’ve all seen the violent ugly outbursts that has happened in various cities over the past couple of months with Japanese businesses and people attacked. There’s no doubt in my mind that Sae and Mariya will get some kind of abuse by the Chinese nationalists. It’s gonna be like a red rag to some of them if they know some famous Japanese idols are living in Shanghai. I fear for the safety of the two girls I really do. I thought that Aki-P would have at least delayed their transfer. I wonder if the two girls are apprehensive about going? I read that Sae had her farewell party the other night with Team K and said that going to China would give her a chance to do things she wouldn’t be able to do in Japan. It makes me wonder if any of the SNH members harbour any hatred of Japan inside them – how will they feel seeing Sae and Mariya amongst them? I do hope they’ll get some proper protection. Thankfully this transfer is only going to last between 6 months and 1 year. Sae/Mariya – please be careful and look after yourselves. I wish both of you the best of luck in Shanghai. Also well done to Sasshi for her 2nd no.1 single. Although sales figures were down compared to Soredemo Suki Da Yo, she still beat KARA by 10k to secure the top spot. I’m also loving the new AKB48 single Uza. It’s the best thing they’ve released this year. 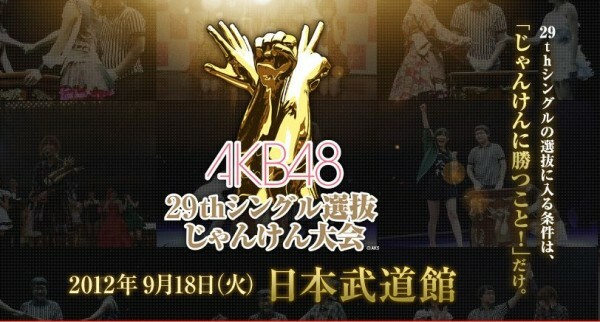 Many congratulations go to Haruka Shimazaki for winning the 29th single Janken Tournament that took place earlier on today at the Nippon Budokan. In the final she squared off against Nito Moeno. It’s been an incredible year for Paruru – she’s got the lead on Majisuka Gakuen 3 and has now won this tournament as well to become the center for the December single. I really thought that Ucchi was going to perhaps win for a 2nd time but she bowed out in the semi finals. Also well done for Mariko who also progressed very far in the tournament. I’m delighted that Umechan managed to get into the senbatsu. I was willing her on so much to win the tournament but she can be proud for knocking out Kojima Haruna who will miss out on being in the senbatsu for the first time in her AKB48 career. Some fans are already unhappy with the results and have come out with some stupid comments that the tournament was fixed for Paruru. Come on guys, I’m not happy that Umechan didn’t win but this tournament is just a game of luck and today Lady Luck was with Paruru so I’m not going to start sulking about it and come up about a conspiracy about the tournament being fixed. Let’s just accept the result and move on. Many will obviously think that Takamina has been demoted but that’s not the case. She’s been given the role of being AKB48’s General Manager, something she’s been doing for ages anyway. It’s just from today she’s been given a fancy title with her duties. Congratulations to Mariko on being handed the captaincy of Team A. Many congratulations to Yuko on her promotion to team captain. There are rumours going around that making Yuko the captain is to prepare for Sayaka’s graduation from AKB48. I hope that’s not true. Obviously I’m delighted with my oshi Umechan being promoted to being captain of Team B. I’m sure she’ll do a great job but I do feel sorry for Yukirin. I’m not sure if any of the members that have lost their captaincy roles today think this demotion has happened because they did a bad job previously. I’m sure that’s not the case – it’s just a case of freshening up things that’s all. And now we come to the members that are leaving AKB48 completely and moving to another group and another country. Some will have to learn a new language to get along with their new teammates. Some of the members have personally asked to be moved to an overseas group or down to HKT48 so this isn’t something that’s been forced on them. With the tension happening right now between China and Japan over the disputed Senkaku islands, I say let Sae sort it out now that she’s moving to Shanghai. She’ll have the Chinese eating out of her hands!! So if this is what happened on Day 1, what are the big announcements that are going to be on the 2nd and 3rd day? As I mentioned very briefly in my previous post, Yuka Masuda won the role of Dorothy against other AKB48, HKT48 and SKE48 members in the musical stage play The Wiz. A total of 186 members from all of the groups tried out for the part of Dorothy but in the end it came down to 6 members in the final audition (Umechan, Yuttan, Nakaya, Mariko Nakamura, SKE48’s Makiko Saito and NMB48’s Sayanee). You may have seen the preliminary part of the audition on an edition of AKBingo. I really wanted Umechan to win and although her dancing skills was second to none against the other girls, I believe that the director of The Wiz play Amon Miyamoto made the right decision in picking Yuttan. I’m not saying that Umechan has a bad voice at all but it just wasn’t as strong as Yuttan. She has such a great voice, one of the best in AKB48 and she had made a big effort in order to win the part so I congratulate her on her victory. Wiz ~Oz no Mahoutsukai~ to give the play it’s full name is scheduled to start on September 29th and will run through to November 6th. It will tour the country with Osaka, Nagoya, Yokohama as well as Tokyo venues being used. Good luck Yuttan. I’m sure you’ll wow the audiences.